Summer is in full swing at Grasslands Meat Market with $5 BBQ, Brews & Booze, available from open until close daily. Savor some of Grasslands flavorful and meaty $5 small plates, such as tender Rib Tips smoked for 6 hours and served with housemade BBQ sauce; or Brisket Sliders with thinly sliced brisket on a soft roll, served with housemade mustard BBQ sauce. Pair the savory eats with a selection of $5 house wines, martinis, brews and $7 IPA’s; or try it with the featured cocktail of the month, the Rubearinha ($11). 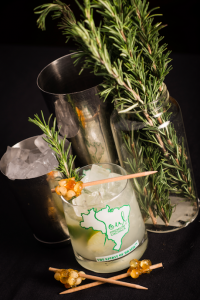 Designed to match the flavor profiles found in Grasslands meat selection, the Rubearinha is similar to a Caiperinha and made with Cachaca, muddled lime, and hints of honey, rosemary and garlic for a unique twist. Purchase the Rubearinha or any craft cocktail from Grasslands extensive bar menu and receive a complimentary $5 small plate through the end of July. In celebration of the restaurant’s one-year anniversary in June, Grasslands will roll out exciting specials all season long. The BBQ Box, introduced last month, will continue through Labor Day (or while supplies last). Featuring over 10 pounds of food, the box includes the signature house meat, Picanha, along with two racks of St. Louis ribs, one rack of beef ribs, one whole chicken, mashed potatoes, black beans and a fresh green salad with choice of dressing. The BBQ Box can be purchased for $99. Free parking available at GardenWalk for first hour, validation provided for second hour. Grasslands Meat Market is a unique meatery and eatery, serving top quality meats that are adventurous in origin and culinary landscape, distinctive in preparation, and intriguing with unique and delicious flavor profiles. Whether its roasting, smoking or barbecuing, Grasslands’ team of meat masters bring together the art and science of preparing the most tender and flavorful meats through the use of techniques that originate from different countries across the world. Grasslands offers something enticing for everyone with a sizeable dining menu, kids menu, full bar and large, rustic open space for celebrations, parties, special occasions and more.